Heat oven to 350°F. Lightly spray 11x7-inch (2-quart) glass baking dish with cooking spray. Heat oil in 10-inch skillet over medium heat. Add onion and cumin; cook and stir until onion is tender. Stir in beans. Place about 3 tablespoons bean mixture in center of each warm tortilla. Top each with 1/4 cup Monterey Jack cheese. Roll up tightly; place, seam side down, in baking dish. Spoon enchilada sauce over tortillas. Spray sheet of foil with cooking spray; cover baking dish with foil, sprayed side down. Bake 30 to 35 minutes or until thoroughly heated. Sprinkle with Cheddar cheese. Serve enchiladas with salsa. Garnish enchiladas with fresh cilantro. When chopping this pungent fresh herb, use both the leaves and the stems. Use low-fat or fat-free cheeses for a lower-fat enchilada. These black bean and cheese enchiladas prove that dinner doesn’t have to be complicated to be delicious. A simple mixture of onion, cumin, black beans and Monterey Jack cheese are tucked inside flour tortillas before being rolled up and doused in enchilada sauce. After 30 to 35 minutes in the oven, these enchiladas get another layer of cheese, then they’re served with salsa and fresh cilantro, if you’d like. Want to cut down on the fat in this recipe? Swap in low-fat or fat-free cheeses. 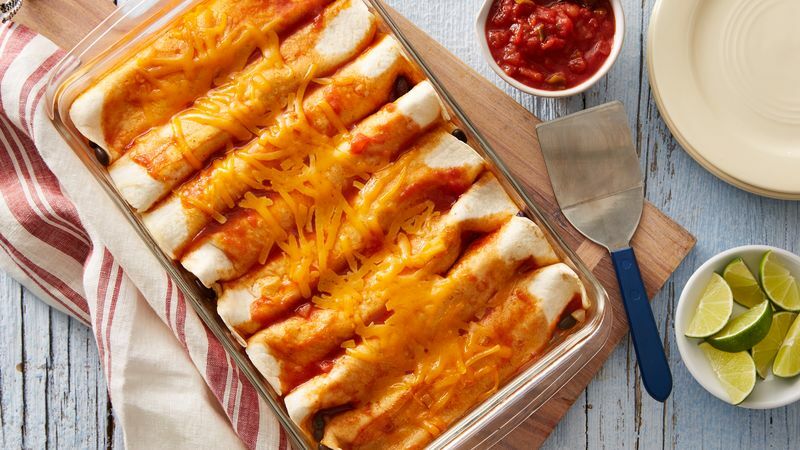 Even though these are meatless enchiladas, thanks to the cheese and beans, they still pack 29 grams of protein per serving. Looking for something more interesting? We’ve got plenty more enchilada recipes where this one came from!